The official weigh-ins for “UFC on FOX: Evans vs. Davis” take place today at the Chicago Theater in Chicago, Illinois. Stream Friday’s weight contest live right here on 5thRound.com starting at 5PM ET/2PM PT. 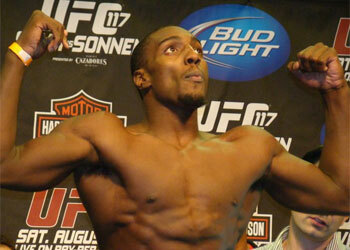 Saturday’s show features a light heavyweight scrap between Phil Davis (Pictured) Rashad Evans. Middleweights Chael Sonnen and Michael Bisping will serve as the night’s co-featured attraction.